Tour Guides & Operations Staff. 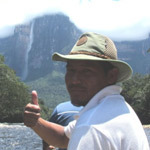 Born in Kamarata Valley, Venezuela; Arturo is the proud father of three and still lives in Kamarata, Canaima National Park. 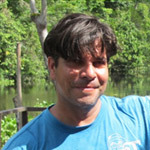 He is a regular leader of Angel-Eco’s trips to Kamarata Valley, Auyántepui and Angel Falls. He speaks English well and has a great sense of humour and of course his knowledge of the Pemón, their culture and surroundings complements every trip. He is also a regular leader of the “team” that climbs to the top of Auyántepui with groups. 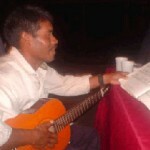 In between trips he studies at University in Ciudad Bolivar and hopes to graduate in June 2012. He speaks his native Pemón (of course) English and Spanish and is studying other languages too in his spare time. 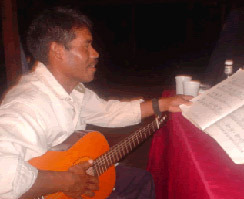 Clemente is an active member of the Pemón community in Kamarata Valley, Canaima. He is married, has four children, and lives with his family in Kamarata close to the Pemón Lodges of Kavak and Uruyén. He was born in Guayana and came to Canaima early in his childhood. He has worked in tourism for many years and believes that is the future for him and his family. Without tourism he says, “Men in the community often resort to working the mines and even panning illegally for gold in the local rivers, to earn a small amount of money to clothe and feed their families.” When he is not working with tourists he hunts to feed his family but has to travel longer distances each time he leaves to locate game. He would like for his son to grow up as a tour guide or own his very own tour operation and for his daughters to grow up and study to be nurses or teachers. He tells us that he prefers to speak English than Spanish but is naturally proficient in both and of course his native tongue – Pemón. Clemente loves to entertain tourists with his mythical stories of Canaima as well as share his beautiful surroundings with visitors. One visitor left him a guitar, one some Beatles music scores and almost overnight he has learned how to play for his visitors. He is very interested in the local flora and fauna and hopes that he can help visitors to identify many of the local species that exist in his surrounds. He is a freelance guide, working often with Angel-Eco and Osprey Venezuela as their lead guide in Uruyén / Kavak. Clemente hopes that he can educate the local youngsters in ecotourism and its benefits as well as help outsiders understand the fragility of their culture. Through Project Kamarakoto we are working with Clemente to empower the local community – education and medical supplies top the list. Born in Caracas in 1971, Venezuela; Leo is one of our most respected nature tour guides – he doesn’t miss a thing when you are on tour with him. He is an interesting character, apart from knowing Venezuela like the back of his hand he is an avid bird watcher and can pick out most birds by their “call” alone – he has also worked and trained as a tour guide at Hato Cedral which as most know the location is full of wildlife and abundant bird life. He says he is always on the lookout for new species of birds that either he hasn’t seen before or are appearing here for the first time. He lives to travel and has a special respect for the indigenous peoples we meet along the way always offering them a friendly hand or sound advice to improve their tourism knowledge. He speaks English well and is conversant in Russian and Spanish. Born in Caracas, Venezuela; Benjamin, father of two, is Angel-Eco’s “Operations and Logistics Manager”. A fine character with a great sense of humour, another great asset to have on the Angel-Eco team. Apart from his love of music in his spare time he is also helping to establish our not for profit “Fundacion Etnika” (the sister company of Angel Conservation) in Venezuela and will occasionally jump in to help with airport transfers and guide local tours in the centre of Caracas and do his part in helping folks enjoy their stay. Ben’s English is immaculate and his job skills vast, he was a former tour guide and knows the country like the back of his hand, apart from being a good friend we partner each other at Angel-Eco Tours and Osprey Expeditions (Angel-Eco’s inbound operation). Apart from his kids he enjoys life to the full and loves music as mentioned previously, he has his own band and regular groups that he sings and plays with – maybe you could be lucky when visiting and catch a performance somewhere.